C4 Ripped is a pre-workout supplement that combines the explosive energy of C4 with ingredients specific to fat loss. This formula helps you train harder while supporting your body’s ability to burn fat. Our proprietary formulated Ripped Blend is designed to enhance fat loss by harnessing the power of L-Carnitine, Green Coffee Bean Extract, Caps Imax Cayenne Fruit Extract and Coleus Forskohlii Root Extract. ‡Based on sales of C4 branded pre-workout products in the U.S.A. from 2014 to the present, C4 is America’s #1 Selling Pre-Workout. I’m sure most of you have more than enough experience with pre-workouts, thermos, etc, so there won’t be a need to cover every last detail here. Instead, I’ll just point out the merits of each product tested, which were this C4 Ripped and SKALD powder. These were alternated over the course of 6 weeks. Ok, C4, starting with the peeves: beta alanine is not necessary for this, especially at such a high dose, and neither is the arginine. There’s also way too much cayenne (added to boost thermogenesis), which adversely affects the flavor. Between the beta alanine and cayenne, it’s almost as if the aim was to have every user burn from lips to rear end, plus all points in between. Aside from this, the profile is pretty good to help boost metabolism and energy levels, although not completely remarkable. SKALD powder: No peeves with this one. While there are the thermo/fat burner mainstays, which don’t sway my judgment one way or the other, they do include a couple unique ingredients to help improve breathing. This is a huge selling point for me, because it actually addresses one of the most important aspects of cardio, which is endurance, and that takes air. Lots of it. This company is doing it right, and not just packing in a bunch of stimulants, like everyone else. The balance of energy and oxygen delivery makes this stand out in a very good way. C4: As mentioned above, there’s too much cayenne, which does nothing to complement the cherry limeade. Otherwise, the flavor is enjoyable. Dosing is standard, at one to two scoops. Mixability is fine. SKALD: Again, no peeves. The strawberry lemonade flavor is excellent. Mixes great, with no noticeable settling. Standard dosing of one to one-and-a-half scoops. C4: Good energy and focus. Definitely gets the sweat going (did I mention the cayenne?). Fitness burns out at about 45 minutes, on average. I dropped 2% body fat total on this cycle. SKALD: Same as C4, regarding energy, focus and sweat (minus the cayenne, thankfully). However, fitness goes longer, at a little over an hour, due to the respiratory/endurance boost. Dropped over 3% body fat on this cycle. C4: I bought this at around $32, which comes out to more than a dollar per serving. Pretty standard. SKALD: Got the same size for $24.97, which comes out to under $0.84 per serving, which is 15% cheaper than C4. Probably obvious, but SKALD beat out C4 on all points. 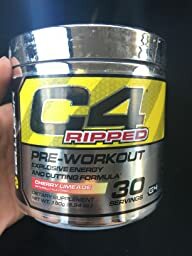 It doesn’t make C4 a bad product, it’s just that this “Ripped” C4 is really only a repackaged version of the original C4 pre-workout. It also doesn’t exactly do anything that any other pre or thermo can do, while SKALD actually has a legitimate purpose with the energy and respiratory-support combo. And even though SKALD is also cheaper than C4, it would still be a better value at the same price, or even more. Fat loss was almost double with SKALD, and the flavor was better (if only C4 didn’t have ALL that cayenne). So, to be fair, C4 gets the job done. Just not as well as SKALD. This is seriously the best pre-workout I’ve ever purchased. It feels weird when it first hits, I felt really itchy. Once you block that feeling and focus on your workout it gives you that extra boost. Will buy again when I run out. When it arrived I was surprised by its size, it’s small but pretty damn cute. That being said so far this is one of the best tasting C4s I’ve had. It definitely gives me more energy, but it also gives my boyfriend and I a little more of a tingly feeling than the regular C4.